NEW! DIRECTV’S NEW WORLD SOCCER TICKET PUTS EVERY SPANISH SPORTS CHANNEL IN ONE CONVENIENT LOCATION! 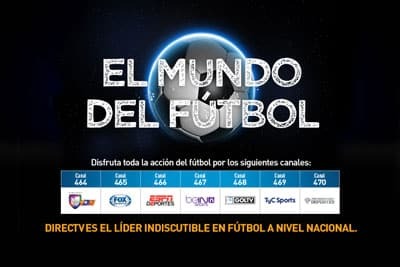 DIRECTV soccer fans now have access to the most soccer year round, all in one convenient location, with our new Spanish sports section World Soccer Ticket (El Mundo Del Fútbol). This great programming addition will enhance your Soccer viewing experience. It is one more reason why DIRECTV is the undisputed leader in soccer coverage in the US and the official sponsor of your passion for soccer! Soccer is the fastest growing sport in the US. Make sure you have the World Soccer Ticket channels in your DIRECTV programming package. CLICK HERE to download a copy of our commercial channel lineup or call 800-951-1979.